hiring the foreign worker will not adversely affect the wages and working conditions of similarly employed U.S. workers. Starting March 28, 2005, employers must file ETA Form 9089 under a new LC program named PERM. All previously filed LC applications under either traditional or RIR regulations will still be processed by the two Backlog Elimination Centers in Philadelphia and Dallas. Earlier cases may be withdrawn and refile under PERM for the same employment, but there are complications and risks of losing earlier priority dates (PD) if not handled correctly. Since PD is critical at times of visa retrogression, and all existing backlogs are expected to be completed by September 30, 2007, it is no longer a favorable option. How long does it take to receive PERM approval? A priority date is the filing date of a labor certification, or the filing date of I-140 when LC is waived. It is used by USCIS and the Department of State (DOS) to determine whether a case is eligible for adjustment of status, or in another word, whether a visa number is available to this case. LC (Labor Certification) is completely different from LCA (Labor Condition Application). LCA is required in an H1B application (Form I-129, Petition for a Nonimmigrant Worker) that contains information specific to the proposed employment opportunity, such as job title, offered wage, prevailing wage, and employer attestations. DOL may revoke an approved labor certification if subsequent findings suggest that the certification was not justified. In such cases, DOL will send a Notice of Intent to Revoke (NOIR) to the employer, who then has 30 days after receiving the notice to submit rebuttal evidence. If the employer fails to respond, the approved LC will be considered revoked and no longer valid. If the employer files rebuttal in time and DOL still intends to revoke the approved labor certification, the employer will have another 30 days to file an appeal. If the appeal is denied too, the LC will be revoked. DOL will send a copy of the revocation notice to both USCIS and DOS (Department of State). 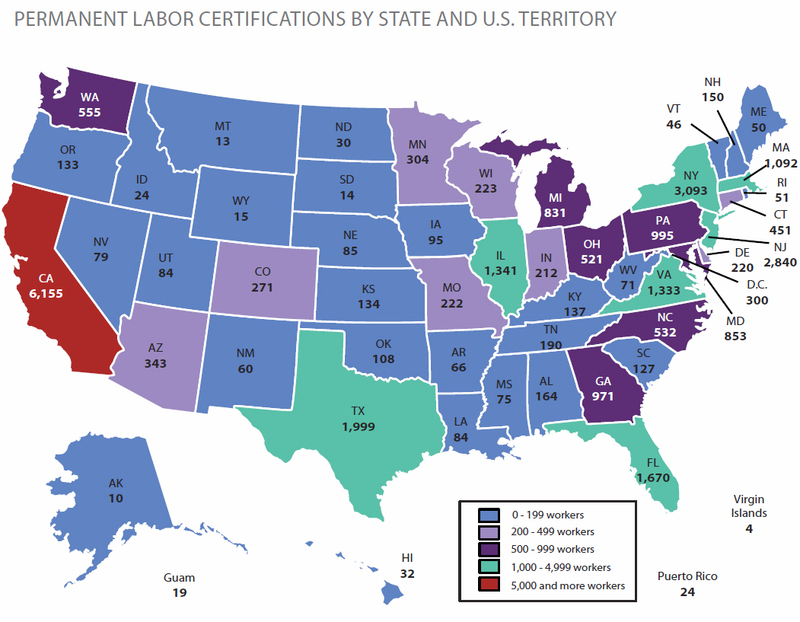 Labor certifications that are approved on or after July 16, 2007 are valid for 180 calendar days. After LC approval, employers will have 180 days to submit the certification to USCIS in support of an I-140 petition. For labor certifications that were approved prior to July 16, 2007, DOL established an implementation period: such labor certifications must have been filed in support of an I-140 petition within 180 calendar days after the effective date of the DOL final rule, i.e., prior to January 13, 2008. So it means that by now, all such "old" labor certifications have expired, if they have not been used already. USCIS will reject all Form I-140 petitions that require an approved labor certification if the LC has expired. USCIS will deny all petitions that are accepted in error when it discovers that the petition was filed with an expired labor certification. All recruitment must take place within the 30 - 180 day timeframe prior to filing a PERM application, except for one of the three additional steps required for professional occupations which is the sole activity that can take place within 30 days of filing. An advertisement needs to include a description of the vacancy, the employer name, geographic location, and contact information. Although it is not required to have many details about job duties and other requirements in the ads, an employer must prepare a recruitment report that addresses all minimally qualified applicants who applied for the job. If an employer chooses to include minimum education and work experience requirements in advertising, they must provide such requirements on the ETA Form 9098 as well. Request a prevailing wage determination from SWA. Submit the information on Form 9098 including the prevailing wage, tracking number, the SOC/O* (OES) code, occupation title, skill level, wage source, determination date and expiration date. Note that under PERM, the salary offered to the foreign worker must be equal to or higher than the prevailing wage, which is different from the old requirement that can be within +/- 5% of the prevailing wage. Complete Form 9098 - Application for Permanent Employment Certification, including detailed job duties and requirements on education, work experience, training/certification, and specific capabilities. A statement of the prospective foreign worker's qualifications is also required. Signatures of the employer, employee, and attorney or anyone who prepared the forms. An application filed electronically also must be signed by all parties upon confirmation that the application has been received. Retain all supporting documentation and records for 5 years. They are not required in the application, but must be available in case of an audit or otherwise requested by an certifying officer. Register an employer account with DOL's online system at www.plc.doleta.gov. File the PERM application electronically through DOL's designated website. An employer may file the case by mail, but e-filing is strongly recommended. Receive an approval within a few days to two months, if all goes well. If the case is randomly selected for audit, it may take several more months to be certified.